I almost can’t believe it, but my eyes do not deceive me. HTC, in Sense 6 on the new One (M8), has finally realized that changing the wallpaper on your phone, shouldn’t make you want to stab your eye out. I know this probably seems like such a non-story to many, but if you have ever used an HTC product for more than a couple of minutes at a time, you’ll know what I mean. Their Sense skin, while good in some ways, has removed far too many standard Android actions over the years. I’m not saying that changing it up is always a bad thing, but HTC, for no apparent reason that any reasonable person can understand, likes to do things to Android that go against standards that have been there since the beginning of time. Take for example how HTC decided to ruin the simple task of moving an app from the app drawer to the home screen to the dock in Sense 5, when initially launched on the original One. They have fixed it for the most part through updates, but man, was that painful for months. And then you have the point of this post, which comes down to making wallpaper changing harder than it should have ever been. Let me just ask you – how do you change the wallpaper on your non-HTC phone? I’ll give you a minute. You long press the home screen, then choose “change wallpaper” from the pop-up, right? It’s that way on every phone. It’s a standard action. Before Sense 6, HTC asked that you pull down your notification bar, tap a Settings icon, scroll to find the “Personalize” section in Settings, tap it, then tap “Wallpaper,” and then choose the wallpaper source before setting the size you’d like. 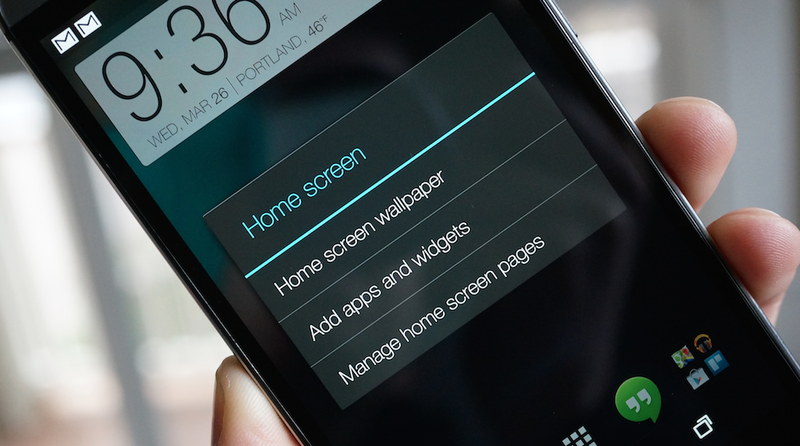 A long press on a home screen in Sense 5 would only open up your widgets adding menu. Don’t believe me? HTC’s own support page for changing wallpapers has those exact steps listed out. In Sense 6 on the new One (M8), they finally made the long-press give you a menu with options, one of which is a “Home screen wallpaper” selector. Good job, HTC.